Shop Front Re-Coating | Visioncare Baker Street London. Visioncare moved into their premises on Baker Street in 1991.This exclusive opticians in London provides customers in Marylebone with a range of designer glasses and sunglasses including Cartier, Prada, Gucci, Tag Heuer and Chanel. The owners of this business wanted shop front re-coating on their exterior and interior to match their exclusive image and Vanda Coatings fitted the bill. Most of the work on the exterior was carried out during the day while the shop was live, but the operatives couldn’t start work on the interior until about 6pm after the shop had shut. This meant long shifts for our boys in London, but Vanda Coatings always work around the client’s needs, so that there is the least amount of disruption to the running of any business. Health and safety is of paramount importance to us, so before starting work on the exterior, the shop was cordoned off using barrier tape and cones. These barriers were created in sections on the busy street in order to protect the public from the wet paint on the part of the shop front the team were working on. 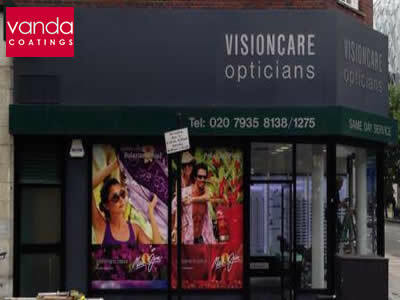 The whole exterior of Visioncare in Baker Street was re-sprayed which included the doors, windows, canopy and signage. The team were informed the signage was going to be changed, but it was masked off anyway to protect it from overspray. A tower had to be built because the signage and canopy were too high to reach using a ladder. Again, health and safety is extremely important, so all our Vanda teams are PASMA trained (Prefabricated Access Suppliers and Manufacturers Association) and have the appropriate certification. PASMA is a trade association for the mobile access tower industry. Visioncare requested a dual coloured re-coat for their shop front, so obviously the two colours were applied separately which took a little more time than if it had all been painted the same colour. When spraying inside, the entire shop and all the products were masked off to protect the valuable merchandise. This entailed covering display cabinets, counters, desks and window panes with speedy mask and as usual our professionals de-masked and cleaned up once the shop front re-coating had been completed.